I meant to post this ages ago, but forgot, and only remembered when I was pulling the FreshBooks Festivus pictures off of my phone. I was walking along a street near Bridgehead in Hintonburg in early December and heard a CLONK CLONK CLONK CLONK right beside me. 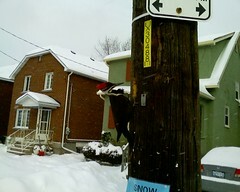 I turned, and saw a tiny woodpecker head peeking around the telephone pole at me! When I’d come close to the pole, he’d clawed his way around behind it and was patiently waiting for me to move on. As I walked away he came back around the pole and started working again. If I came closer he’d go back around and peek out. The hole was probably two inches deep and an inch around. Can’t be good for the phone pole. At first I figured he was looking for bugs for food, but it turns out that the drumming is how he lets female woodpeckers in the area know that he’s here and lookin’.